Mixing colored fabrics is a very skilfull task and is often left completely up to the taste individual. Please give the color of your fabric significant thought before you start as the smallest mistake or incorrect color matching can really have a huge effect on the quilt! Remember you can change the colors in your quilt at any time if you are not happy – it is always much better to take a color out or unpick a few squares and start again then continue and find out that you do not like the finished quilt! 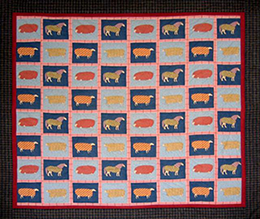 Many hours of hard work go into making quilts and it is not really rewarding to make something that you are not completely happy with or that has materials and colors that you don’t like or that do not blend well with the intended display area.